Your wedding day...remembered for the RIGHT reasons! Everyone wants their wedding day to be remembered; for all the right reasons. There are many pieces of the puzzle and they must all work together to form a beautiful, complete picture at the end. Like so many other “wedding” things, this is your choice. If done well, it can make the overall event sparkle and shine with festivity. Before interviewing DJ’s, decide, as a couple, what sort of mood you’d like to set for the evening. Asking yourselves “What do we want our guests to say at the end of the night?” If you close your eyes and envision the end of the night, what does it look like? Do you want soft romance? Or do you want a raucous party? A good DJ will not only ask for this vision, but help you create it all evening long. Please keep in mind the size of the puzzle piece, as well. The food is important, but it is only a portion of the evening. The flowers are crucial at the ceremony, but only seen in the periphery at the reception. The photographers job is to remain as “hidden” inside the action as possible, not on the main stage. But the music? It sets a mood that will last all evening long. Your reception is you hosting a party; even better, a party with all your closest friends and family. As a result, it needs to accommodate a wide range of ages and tastes. It may seem impossible, but it needs to cater to the best of all their differences. A good DJ will know how to do that. Not to put too fine of a point on it, but think of it this way: At an average wedding, a DJ will talk to 50 people, setup 17 events, and manage 250 people for 5-6 hours. That’s a great deal of wrangling. It takes people skills and good time management. As a result, experience matters. Which is why the decision comes down to the end result and not just price. 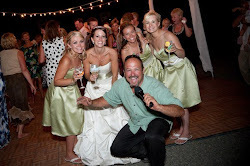 Your DJ will have a massive impact on your wedding and can make or break the evening. So it’s worth taking time to plan and choose the correct person (or team) for the job. 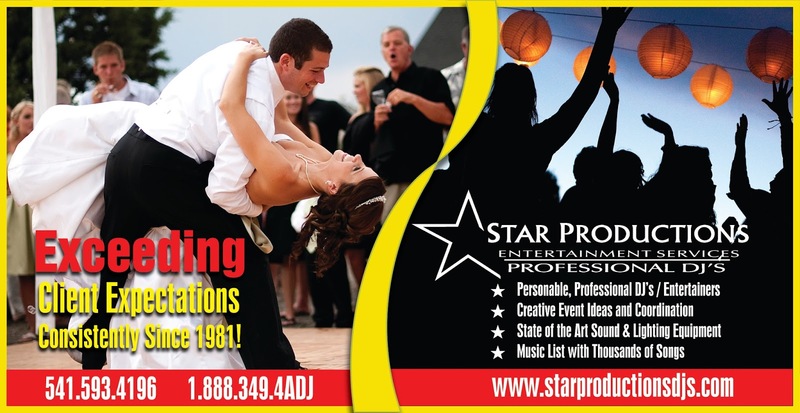 Star Productions DJ's creates a Save the Date video for our clients INCLUDED in most packages!! Here's a sample video of what we did! Our brides love it! We'd love to do the same for you! 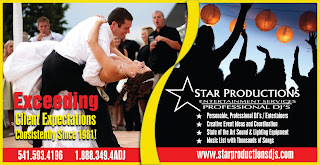 email starproductionsdjs@gmail.com for more information. The purpose of the wedding toast is to HONOR the person to whom it is offered. You want to leave them feeling good about themselves - not hurt or humiliated. This doesn’t mean you can’t have fun by gently teasing or poking fun, as long as you remember that the purpose of a wedding toast is to HONOR the bride and groom and to help celebrate their marriage. 1. Be yourself. If you try to do something that’s not natural you can come off sounding pompous. 2. Keep it short. A wedding speech should be under 5 minutes. People often lose interest if you carry on any longer. 3. Be authentic. You have a wealth of information you can use in your toast. Pull from humorous stories in the past you’ve shared with them. 4. Be balanced. Try not to get carried away. Trying to write stories out as a comedy routine can take it over the top. 5. End on a positive note. If you’ve been humorous, go serious at the end with praise. Talk about how you admire them, what their friendship means to you, why they’re perfect for their new spouse, or how you’ll miss them now that they’re married! 6. Poke fun at yourself before teasing someone else. By demonstrating that you can laugh at yourself the audience will be more willing to laugh with you as you poke fun at someone else. 7. End with direction. Focus your attention on the subject of your toast, raise your glass and ask the guests to join you in a toast to the bride and groom. 8. If you run out of stuff to say - END THE TOAST! A simple raising of the glass and saying “To the bride and groom!” can help bail you out if you’re struggling to find something to say. 9. Keep it “Grandma friendly”. Try not to bring up past relationships that they may have had or what might happen on their honeymoon, etc. Keep it clean! 10. Prepare in advance. Nothing you can do on the day of the wedding will be as good as something you prepare in advance. While this is no means a comprehensive guide to giving a toast hopefully it will allow you to be better prepared and able to offer a memorable tribute. If you want more information about toasting I highly recommend “Wedding Toasts Made Easy” by Tom Haibeck. Still Considering the DIY DJ idea? DJing your own wedding is a great way to save money, and it allows you control of your reception playlist. Yet a DJ does a lot more than just push play, and if you don't plan ahead, you might end up with poor sound, the wrong songs, or technical difficulties! Along with your main Mp3 player and its power cable, it's a good idea to bring a second Mp3 player or a laptop - all loaded with your music. You'll also want to have on hand the name of an equipment rental company who does last minute deliveries. In case no one is dancing and you need to switch directions, you'll want that extra hour or two of music mentioned above. Odds are, you won't need any of your backups, but the cliché of "it's better to be safe than sorry" is especially true in this case. There's always that one guest who doesn't like what's playing and tries to change things up. Instead of bombarding a regular DJ with requests, she'll be trying to hit shuffle on your playlist, or even switch the cable to her own device. But you can prepare for this bad wedding guest. First, ask for music requests, either on your wedding website, or on your reply cardswith a line like "Name some artists or songs you're hoping to hear at our reception" or "What songs are sure to get you dancing?" Hearing a favorite song might satisfy a would-be guest DJ, but in case it doesn't, you should have an IPod minder or "freejay" who can guard and hit play for any special songs. When the freejay inevitably needs to take a break, hide your device under a taped-down piece of paper that says, "We've chosen our wedding playlist carefully. Please don't touch the IPod!" Make sure you've got a song for every special moment in your wedding, from the first dance to the last one. Here's a wedding reception music plan, which will make sure you know which song should be played and when. Load these key pieces of music onto a separate playlist, ready to cue when necessary, or use an app like MyWeddingDJ. One of the most important things that a DJ does is create transitions between songs. Six seconds of silence might not sound like much, but it's certainly enough to kill a mood and empty a dance floor. You might also have a favorite tune with a long intro or an extended ending that just won't work. Fortunately, there are DIY DJ solutions to these problems. Some models of IPods allow gapless playback. You can also use iTunes to both crossfade and cut songs, and DJ apps like Virtual DJ or My Wedding DJ can help you with advanced techniques. As soon as I posted my Do Not Play List, I started to hear complaints from professional DJs that these were the best songs to fill a dance floor. While I agree that you can use the Chicken Dance or the Electric Slide to bring out some shy folks, there are better and less cheesy ways: Wedding Music To Get Guests Dancing. One of the prime reasons to DIY DJ is that you can control what gets played and avoid the cheese, but I think we can all agree that your wedding is not a time to play only death metal or emo music. You need to think about your guests as well as yourselves. Dave Star's Game Show! Great for office training or office Holiday Parties! Book it for your office party today! As you can see...Game show is fun for all ages...we customize game show for your business! This is a super idea for a fun holiday get together! Call dave today at 5414194090.